Eden Corporate Travel is part of Australia’s largest network of premium independently owned corporate travel agents and travel management companies. Our membership of Helloworld Business Travel unlocks a world of advantage for you. It means buying power along with ongoing investment in state of the art technology, research and support so that we provide you with the customised solution that best meets your needs now and in the future. It also means access to the purchasing power, reach and relationships of Helloworld Travel (HLO:ASX), a leading Australian-based travel distribution company. The support of a team of seasoned, committed travel professionals with relationships and purchasing power that make the world of difference. At the core of every Helloworld Business Travel agent is a passion for excellence. We focus on excelling at every level so that the support and travel solutions we provide meet your goals. Plus, our commitment to ongoing improvement means you continue to benefit from changing market and corporate conditions. We do this through our continual investment in tools, technology and services to drive innovation in new products, reporting and even easier ways of managing your travel. We’re business owners and managers just like you. When you choose us as your travel partner, you partner with a team driven by the same imperatives as you and your business. Plus you deal with the person who owns the business. As commercially astute business owners ourselves, we know that it needs to be right first time, every time. We enjoy the challenge of delivering exceptional business-to-business travel service within a framework designed to achieve your objectives. We believe it’s more than just being there when you need us. We believe in systems and people who proactively identify the support we provide to you. So, if travel plans are disrupted, whether through natural or man made events, our expertise, relationships and reach through Helloworld Business Travel mean our clients resume their travel plans quickly and safely. Our success as business owners is built on taking personal responsibility for travel solutions that work. It’s about meeting the needs of all our clients with tailored solutions. Our clients are diverse in size, sector and the level of support they require from us. Our solutions, too, are diverse and built with each individual client in mind. We invest time, expertise and commitment in getting it right because we know it matters. We respect and harness the power of individuality at a client, supplier and employee level. Integrity, respect and transparency frame every interaction. The Helloworld Travel Limited Customer Charter and Consumer Protection Policy enshrine our determination to provide excellent customer service and support. Helloworld Business Travel is a division of Helloworld Travel Limited, which is an integrated travel service provider encompassing retail, wholesale, corporate, inbound and tour operating businesses in Australia and around the world. Helloworld Travel is publically listed on the Australian Stock Exchange (ASX: HLO), and represents over $3 billion dollars’ worth of buying power in the travel industry. Choosing a Helloworld Business Travel agent as your travel management company unlocks the best of both worlds – the commitment, dedication and attention to detail of an independently-owned and operated business as well as the many benefits of our association with Helloworld Travel. Decades of experience with global pharmaceutical companies, medical institutes, money broking, merchant banking, engineering and construction businesses have made the transition to Eden Corporate Travel that much easier for new clients. There is no real substitute for the advice and twenty-eight years’ experience of MD Andrew Want, and our team of consultants. We do offer many useful on-line facilities, booking engines, links to reference material, enhanced accounting and reporting software. On-line reporting, billing and accounting data provides desktop monitoring of the implementation of company travel policies, and expense management. Bespoke reports can be tailored by Eden Corporate Travel to reflect specific needs provided at required intervals. Travel arrangements are only the first of the many services we offer – others include site selection, accommodation, catering and technical support facilities. eGlobalfares assists us to immediately increase airfare value to our clients, derailing the perception that we are not searching everywhere possible to find you the best fares and international fare savings where possible. We access local market specific published and private airfares from over 70 countries all directly from Australia. Ability to globally manage small corporate accounts without the expense of investing in brick and mortar services. Collaborate on multi-national/global bids and the servicing of those accounts 24/7/365. We have invested in a mutual partnership with GlobalStar, a worldwide global travel management company group, providing ‘best in breed’ local expertise and solutions with over 85 market leading enterprises, representing over US$14 billion in sales. All partners have been chosen for their similar approach to providing service excellence. We combine their local expertise, strength and commitment with our organisation to deliver cohesive, multinational solutions through innovative technology platforms for our clients. Global Locations – The ability to introduce a global travel program for your business operations outside of Australia. Savings – Increased savings to you from local/global airfares and hotels otherwise not accessible in Australia. Service consistency – Consistent service delivery and program management across all locations driven by you. Local Knowledge – Each GlobalStar partner is independently owned, a leader in their respective local market, and have a vested interest in the success of each client account. APX Travel Management is a wholly owned subsidiary of Helloworld Travel Limited and can provide exclusive support for Helloworld Business Travel agents to leverage additional end-to-end travel management services for our clients that require local New Zealand representation. HelloworldBusiness.travel streamlines the process of booking and reconciling business trips by bringing all your favourite travel providers together in one place. You can manage who books what and set other rules to control travel budgets, while saving hundreds of administration hours each year. Most importantly, you have our direct expertise and support via phone and email should our services be required. HelloworldBusiness.travel gives you access to all the biggest travel brands at the best available rates. 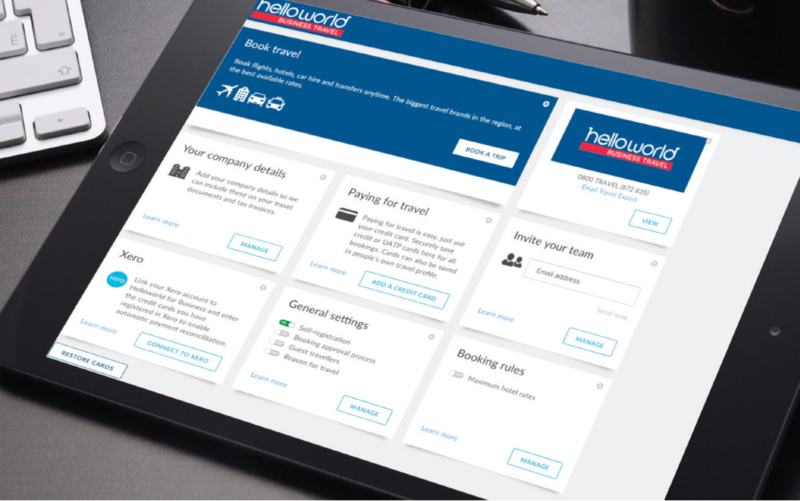 Utilising our HelloworldBusiness.travel Mobile APP is like having a travel agent, a PA and a tour guide in your pocket – everything you need to manage business travel on the go so you can focus on what really matters. It is free for all travellers registered to use the HelloworldBusiness.travel Online Booking Service Tool. Our association with American Express delivers worldwide benefits. American Express is a global brand at the vanguard of travel, financial and business services. American Express delivers products globally for more than 65 million customers, including over a million customers in Australia. We can help you maximise your American Express Membership Rewards points to pay for any travel booked through us. You can redeem points to pay for any travel booking including the best available fare with any airline, prepaid hotel, care hire, holiday packages, taxes, travel insurance and service fees. ATAS is a national accreditation scheme, endorsing travel agents who have met strict financial and customer service criteria. Representing Australia’s best travel agents, we can provide you with peace of mind when purchasing travel.